Watch a video overview of EZ-fit Shed assembly. Please read these instructions carefully before receiving or unpacking your EZ-fit Shed Kit and beginning any construction. • Full instructions are included with your shed. 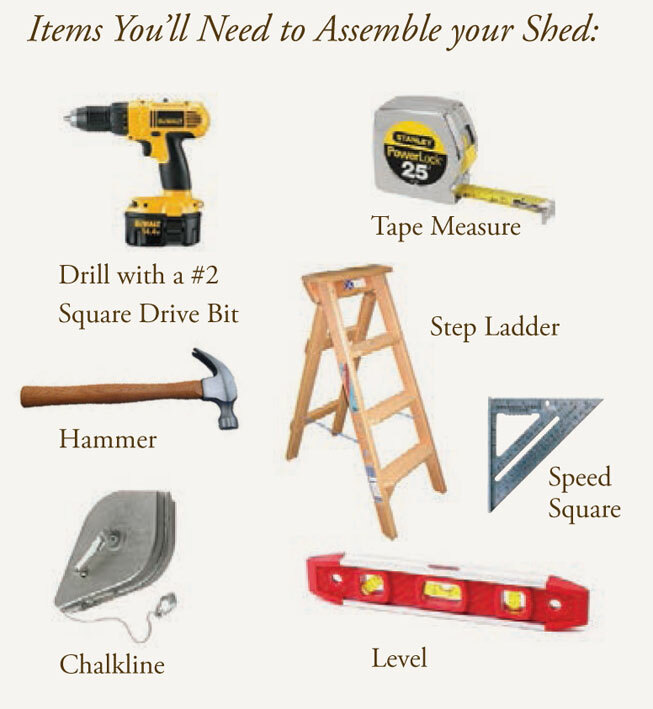 • A level site is the most important step in preparation for a storage building! • The building will only be as level as the site is. • It is much easier to prepare a level site before your building is there, rather than trying to make changes afterwards. • See below for site preparation details. Base should be 12 in. larger than building on all four sides. Remove 3 to 4 inches of sod. Fill back in with No. 8 or No. 57 limestone. Make sure entire area of limestone is level. Place treated 4 x 4s cross ways within shed footprint approximately every 6 feet. Dig treated 4 x4 s into ground on high side. Put concrete blocks under treated 4 x 4s on low side (if needed). is responsible for all building permits according to local zoning requirements. These photos were sent to us by one of our many satisfied customers. From site preparation to a finished barn in a couple "EZ" steps.